WASHINGTON — President Donald Trump referred to Haiti and African nations as "shithole countries" during a meeting with a bipartisan group of senators at the White House, a Democratic aide briefed on Thursday's meeting told NBC News. Trump's comments were first reported by The Washington Post, which said the nations referred to by Trump also included El Salvador. The U.N. human rights office said the comments, if confirmed, were "shocking and shameful" and "racist," while Haiti's foreign minister summoned the U.S. Chargé d’Affaires Robin Diallo for clarification. The White House issued a statement that did not deny the remarks, however Trump tweeted an apparent denial early Friday: "The language used by me at the ... meeting was tough, but this was not the language used." It came as senators huddled in the Oval Office with the president to discuss a path forward on an immigration deal. 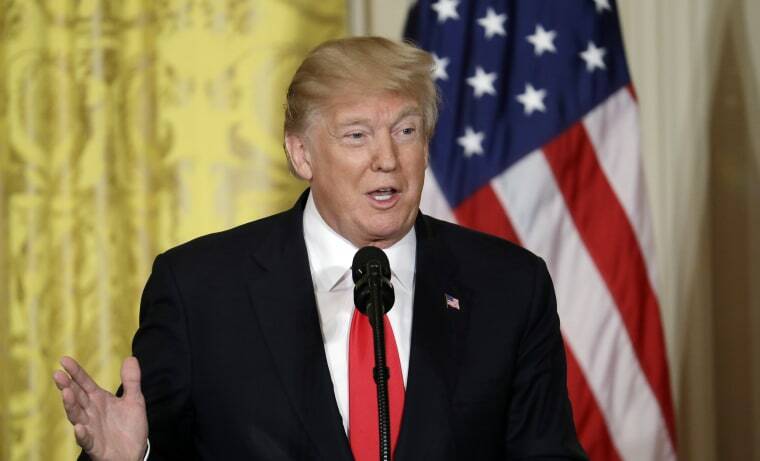 Trump questioned why the United States would want people from nations such as Haiti while he was being briefed on changes to the visa lottery system. According to the aide, when the group came to discussing immigration from Africa, Trump asked why America would want immigrants from "all these shithole countries" and that the U.S. should have more people coming in from places like Norway. Later Thursday, railed against Democrats over ongoing talks on an immigration deal. "The Democrats seem intent on having people and drugs pour into our country from the Southern Border, risking thousands of lives in the process. It is my duty to protect the lives and safety of all Americans. We must build a Great Wall, think Merit and end Lottery & Chain. USA!" he wrote. Botswana's government on Friday said Trump had been "reprehensible and racist," and said it has summoned the U.S. ambassador to clarify whether the nation is regarded as, to use Trump's word, a "shithole" country. U.N. human rights office spokesman Robert Colville told reporters that the remarks could "potentially damage and disrupt the lives of many people." The "shocking and shameful" remark "legitimizes the targeting of people based on who they are," he said, adding: "I'm sorry, but there's no other word one can use but racist." The African Union said it was "alarmed" by Trump's statement. "Given the historical reality of how many Africans arrived in the United States as slaves, this statement flies in the face of all accepted behavior and practice," spokeswoman Ebba Kalondo said, adding that it was “particularly surprising as the United States of America remains a global example of how migration gave birth to a nation built on strong values of diversity and opportunity." In Lagos, Nigeria, IT worker Mayowa Okuwade said: “I think every African country should just learn from this and probably just stay in their country and work with their resources … I am very much sure things will get better." Others quickly decided to own Trump's language or throw it back in his face. "Good morning from the greatest most beautiful 'shithole country' in the world!!!" South African Broadcasting Corporation anchor Leanne Manas tweeted. Republican Rep. Mia Love of Utah — the daughter of Haitian immigrants — released a statement saying Trump's comments were "unkind, divisive, elitist, and fly in the face of our nation's values" and demanding an apology from the president. And Rep. Ileana Ros-Lehtinen, R-Fla., said in a tweet that the reported remark "ignores the contributions thousands of Haitians have made to our #SoFla community and nation. Language like that shouldn't be heard in locker rooms and it shouldn't be heard in the White House". It’s not the first time reports have surfaced of Trump speaking unfavorably about immigrants, and Haitians in particular. The New York Times reported in December that Trump said Haitian immigrants "all have AIDS," during a summer 2017 meeting about immigration. According to the Times, Trump also targeted Nigerian immigrants during that meeting, complaining that once they came the United States they would never "go back to their huts." The White House vigorously denied the claims in the story at the time. Hallie Jackson, Abigail Williams and The Associated Press contributed.